Slow speed at the beginning of boring will securely set a hole cutting position. Optimum drill speed adjustment can be made to bore a hole on difficult-to-cut materials or to securely set a hole cutting position at initial cutting stage. If any lateral movement or excess vibration is detected, both the drill and the feed motor stop. 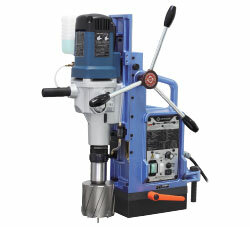 Nitto Kohki is the first company to incorporate this feature into magnetic base drills. If the load is released while the load indicator is blinking red, the drill motor will resume its rotation. The magnetic field will become active, but the drill will not re-start even if power is re-supplied after accidental shutdown. The LED will blink green at this stage. Drilling can only be continued after turning on the drill switch.